The first picture Foran posted on the district’s Instagram page was of a 9/11 tribute that occurred at an all-school assembly at Arcadia High School in 2013. The photograph shows the student body of more than 3,500 linked arm-in-arm while singing the school’s alma mater. Since that first post, there are now nearly 4,000 followers to the page which has posted an incredible 1,065 times since 2013. In 2017 alone, there were 103,646 double taps, aka “likes” for the Instagram novice, to 317 posts. Screenshot of Arcadia Unified's World-Renowned Intsagram homepage. “We started the Instagram page to better connect with our students. Our Facebook page was and is a terrific outreach to connect with our parents and community, but we thought Instagram would better cater to our students, which comprise the majority of our followers,” Foran said. The key to creating a dynamic Instagram page is consistency and creativity according to Foran. He said he has plenty of great stories to share and highlight thanks to the plethora of activities, sports, arts, and academics that are offered throughout the award-winning and highly rated schools in Arcadia. 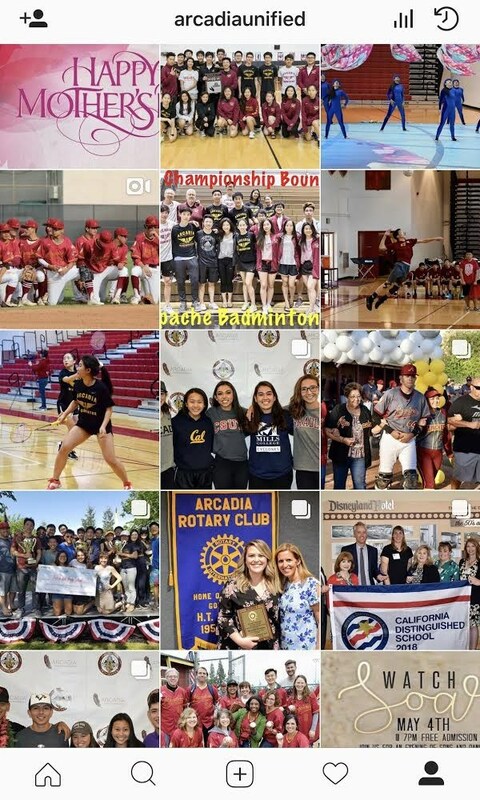 The Arcadia Unified Instagram page has averaged more than one post per each school day for more than four and a half years now. In order to maintain the volume and consistency of pictures posted, the Arcadia Unified page uses a team approach. In addition to Foran, the District's Communications Specialist Amber Nuuvali and several students post on the page. Last year, Foran turned over the keys to the Instagram page to the District’s Digital Communications Internship students. Arcadia High School Senior Naomi Silver, who will be studying journalism at NorthEastern University in the fall, was the first student trusted with the account as a student manager. Arcadia High School Junior Katie Wen has been the Student Manager of the account for the past two semesters. Turning over the login credentials to the District’s social media accounts is something Foran said was not an easy decision, but one he’s glad he made. Arcadia’s social media presence goes well beyond its Instagram page. Facebook, Twitter, YouTube, We Chat, and Weibo are also a part of its digital presence to help spread the news about the District, and many of those pages are also run in part by student interns. The District’s Facebook page has more than 5,500 followers while its Twitter feed boasts nearly 3,000 followers. There are nearly 300 videos that have more than 415,00 views on Arcadia’s YouTube page. All very impressive numbers considering the District has less than 10,000 students. As Buzzfeed eluded to, schools can indeed make a lasting impact via social media. Here’s another heart/like/thumbs up to one local school district that can be an example for many others of how social media can be used as an effective communication and storytelling tool. To view the Buzzfeed article, you can visit www.bit.ly/arcadiabuzzfeed.